Of all the things you would find in a PC, the video system is one that has changed the most. From a simple chip on the motherboard that spat text onto the screen, the video subsystem has grown and evolved into something that could rightly be called a computer within a computer. Though 3D graphics have hit something of a temporary plateau, there’s still plenty of improvement to be had. 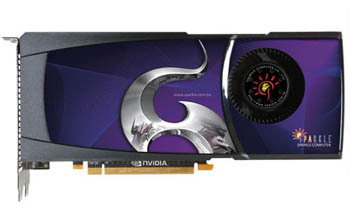 NVIDIA has risen to the challenge, with their latest line of Fermi-based graphics cards. Their top-end cards have plenty of power to spare, but this comes at a pretty hefty premium. $500 is not much to pay for someone determined to have the best of the best, but this only describes a handful of well-off individuals. The rest of us have to make trade-offs; naturally, we want the biggest bang for our buck. Cards like the GeForce GTX 465 exist to fill that niche; they offer performance that’s fairly close to their top-end brethren for a more reasonable price. Sparkle’s sent us a card that looks to be gunning for that market of enthusiastic-gamer-who-isn’t-filthy-rich, based on the GeForce GTX 465 reference design.